Sunt mare fana Urban Decay, si unele dintre creioanele lor 24/7 Glide-On imi plac foarte mult, sunt cremoase si pigmentate. De obicei au mereu editii limitate cu 10 creioane, insa acum au lansat o cutie cu toate creioanele inclusiv 13 nuante noi, sunt in total 40 de creioane full size si setul costa $295. In conditiile in care un creion costa $19, toate aceste creioane cumparate individual ar costa $760, asa ca acest set are un pret extrem de bun :). Perversion (blackest black matte), Zero (zealous black cream), Smoke (deepest gray matte), Uzi (dark gunmetal shimmer w/silver micro-sparkle), Oil Slick (black shimmer w/silver micro-sparkle), Underground (metallic taupe shimmer), Mushroom (metallic taupe-pewter shimmer), Smog (copper shimmer), Roach (deep copper brown shimmer), Bourbon (brown shimmer w/gold micro-sparkle), Hustle (metallic brown shimmer), Whiskey (rich brown matte), Corrupt (dark metallic reddish brown shimmer w/silver micro-sparkle), Demolition (deep brown matte), Desperation (deep taupe/gray matte), Scorch (bronze shimmer w/silver micro-sparkle), Goldmine (gold shimmer w/gold micro-sparkle), Loaded (dark green shimmer), Freak (bright green shimmer), Invasion (deepest dark green matte), Mildew (deep metallic green shimmer), Stash (dark metallic green/gold shimmer), Junkie (metallic teal shimmer w/gold micro-sparkle), Mainline (deep green/blue matte), Deep End (bright metallic peacock shimmer), Electric (bright metallic aquamarine shimmer w/silver micro-sparkle), LSD (navy shimmer w/bright turquoise micro-sparkle), Sabbath (deep navy matte), Abyss (bright metallic blue shimmer w/blue micro-sparkle), Chaos (vibrant cobalt blue matte w/slight floating pearl), Ether (pale smoky gray shimmer w/violet and fuchsia micro-sparkle), Delinquent (dark purple shimmer w/light purple micro-sparkle), Vice (pearly red eggplant shimmer), Psychedelic Sister (bright purple cream), Rockstar (darkest eggplant shimmer), Empire (dark eggplant matte), Asphyxia (vibrant pink/purple duotone w/tonal and blue micro-sparkle), Woodstock (sparkly hot pink shimmer w/silver micro-sparkle), Yeyo (metallic white shimmer) and Cuff (metallic silver shimmer w/silver micro-sparkle). Ca sa fiu sincera, nu stiu cine are da banii pe acest set, in afara de un makeup artist mi-e greu sa cred ca i-ar trebui cuiva 40 de creioane in toate culorile curcubeului, insa e bine de stiut ca asa ceva exista, mai ales pentru ca reprezinta o afacere buna :). Le gasiti AICI. Va plac creioanele Urban Decay 24/7 Glide-On? OMG! 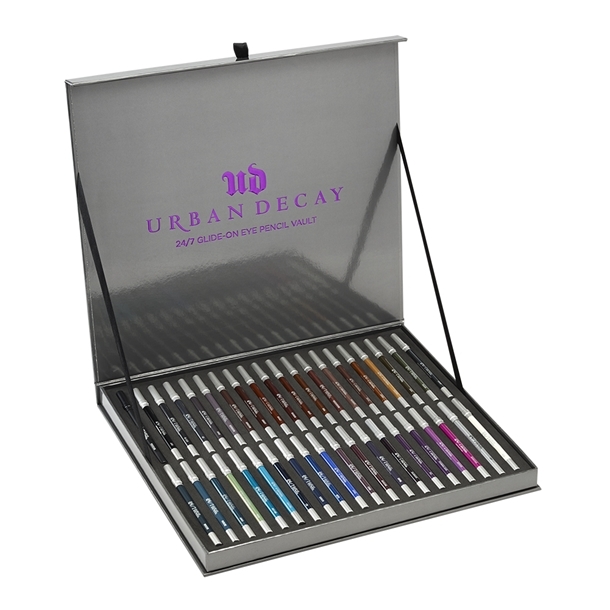 Urban Decay Book Of Shadows III !! !